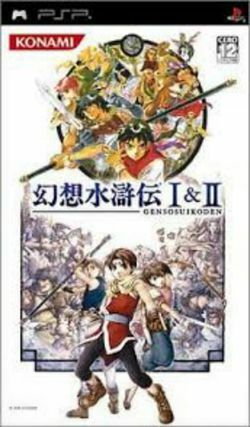 Genso Suikoden I & II (幻想水滸伝I&II, Genso Suikoden I & II?) is a re-release of the PlayStation console role-playing games Suikoden and Suikoden II, ported to the PlayStation Portable. Konami announced the game in the 4th quarter of 2005, and the compilation was released on February 23, 2006. Both games are combined in a one UMD where the player is given the choice which Suikoden game he wants to play, as well as a third choice which is "Gallery" (ギャラリー). The player is now able to move their character diagonally inside places and over the world map. Graphics have been slightly enhanced and redone to fit widescreen. This includes an extension of some places which were designed for PAL and NTSC televisions. The opening movie of Suikoden I is now the one from the Sega Saturn version. Some menu windows changed in orientation. Rune and Unite sequences are faster. The Matilda "Glitch" has been removed. A new "power-save setting" (省電力設定, "power-save setting"?) was added under the options menu which could be turned ON/OFF. If turned to ON, the screen dims for a certain time of inactivity. The background music for the tactical war fights vary depending on the situation of the hero's army. These tracks include the original "Battlefield Without Light" and the un-played from the original PlayStation version, "War". Movies, event viewer and ending only becomes available by loading an end-game save file of each individual game. This page was last edited on 23 September 2015, at 01:59. This page has been accessed 6,176 times.